Washington, D.C. 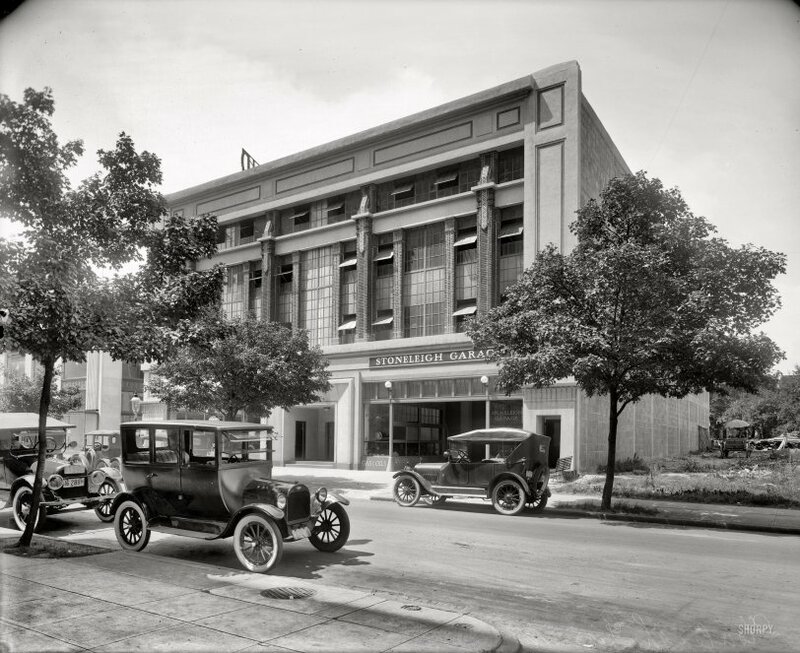 The Stoneleigh Garage at 1707 L Street in 1921, shortly before construction of the gas station next door. National Photo Co. View full size. Submitted by Anonymous Tipster on Fri, 06/26/2009 - 12:23pm. First one I've seen with no access to the right front seat, if there is a seat there at all. Can one of you experts explain this? Taxi or Chauffeur only? Submitted by Anonymous Tipster on Fri, 06/26/2009 - 12:04pm. This garage would have been right across L Street from the Stoneleigh Court apartment house. According to James Goode's excellent book "Best Addresses," when the Stoneleigh was built in 1902 this part of Washington was residential, with luxury apartments and elaborate Victorian rowhouses. By 1921, many of those residences had been torn down and the neighborhood had become the commercial district that it remains today. The vacant lot to the right of the garage was probably only recently vacant. Submitted by Kat on Mon, 06/15/2009 - 12:47am. were classy back then! Nice! I wonder what the sign on top you can barely see says? Submitted by Anonymous Tipster on Sun, 06/14/2009 - 3:13pm. How appropriate: in the empty field, an old dilapidated wagon-cart sits, rotting away, as the modern auto garage gleams with its newness. There is such a division here between urban/modern and rural/antiquated! Submitted by Anonymous Tipster on Sun, 06/14/2009 - 2:28pm. 1920-21 Chevy sedan in the front, not sure about the others. Submitted by Rip on Sun, 06/14/2009 - 2:26pm. Viewing the small image I would swear it was a very realistic illustration. Enlarged it still has a quality I am at a loss to define. I do wonder how this was achieved? Thank you much for this one. Submitted by rick557 on Sun, 06/14/2009 - 1:30pm. Fear not! Upon leaving your car for a lengthy repair, you will have the opportunity to borrow the luxurious loaner, located to the right of the building.